Drip edge is metal edging that is installed on the bottom edge of the eaves (called the “drip edge”) where water drips off the roof. The product was primarily invented and widely manufactured to accompany asphalt shingle installations. This is because asphalt shingles have little structural integrity and will sag over the edge of a roof if allowed to extend beyond the roof edge. Of course, the shingles must extend beyond the roof edge in order to allow the water to drip off the roof rather than run down the side of the building. Since asphalt shingles cannot extend beyond the edge of a roof without support, metal “drip edge” was invented to provide that support — to hold the shingles up so they don’t sag. Slate shingles, being stone, have a lot of structural integrity and will not sag over the edge of a roof. They, therefore, do not require a separate metal drip edge for support and such edgings have never been traditionally used on slate roofs, except in certain situations. These situations may include, for example, when a slate roof ties into some types of metal roofs, or perhaps when it ties into some types of built-in metal gutters. Metal edgings have also been used on slate roofs for stylistic reasons — for decoration. In general, however, metal drip edges are not needed on slate roofs. Then Why Use a Metal Drip Edge? 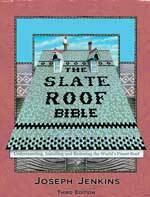 1) Today, many slate roofs are installed by roofers whose primary work has been with asphalt shingles. They often use decking materials that would be considered sub-standard when compared to traditional wood board slate roof decks.Such sub-standard decking materials include plywoods, particle boards, OSB, and anything that is held together with glue. These decking materials are not as durable as wood boards and can benefit by having their exposed edges protected by a metal edging, both at the drip edge and along the sides of the roof (also known as the gable or rake edges). Therefore, metal drip edges have become popular for slate roofs among many asphalt shingle roofing contractors. 2) In addition, some contractors and building owners like the look of a copper edging on a roof system. It adds a rich appearance that compliments the slate and the copper flashings. The small additional cost of copper roof edgings can add a measure of protection as well as additional quality to a slate roof installation. 3) When copper roof edgings are used on a slate roof installation, the standard wooden cant strip that is required at the starter course along the eaves can be competely eliminated and replaced with a copper roof edging that has the cant built right into it. This creates a permanent copper cant strip that is quickly and easily installed. Many inexperienced roofers forget to install the cant strip in the first place. By using a copper edge with a built-in cant, they can’t go wrong (no pun intended). Are Slate Roof Drip Edges Different From Asphalt Shingle Drip Edge? YES! Standard asphalt shingle drip edges are designed to prop up the shingles so they don’t sag over the edge of the roof. Slate don’t sag, but they also don’t lie flat on the roof surface. Every slate is lying at an angle on the roof. This means that any part of a metal edging that extends beyond the roof edge will be serving no purpose on a slate roof because such extensions will not even come in contact with the slate. The slate shingles create their own “drip edge” so the metal edging’s primary purpose is to protect the roof edge, not support the shingles. Therefore, a slate roof “drip edge” will not have the horizontal lip that is needed on asphalt shingle drip edges. This does not mean that asphalt shingle drip edges with the horizontal lip cannot be used on slate roofs — they can. But a metal edging made specifically for slate roofs will not necessarily have the horizontal lip, which serves no practical purpose.